Contemporary instruments offer performers an exciting option in instrument choices. Contemporary instruments of the highest quality can be much more affordable than older instruments of similar quality. Contemporary violin makers work to further the art of violin making and take great pride in continuing a long tradition of the highest quality of craftsmanship. 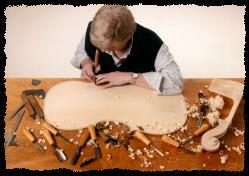 Each individual instrument is a part of the process of cultivating and enriching violin making today. For the performer, owning a contemporary instrument allows the unique opportunity to mold an instrument with your own personality. Having been in business for more than fifteen years, the Beckmann Violin Shop has earned a national reputation as a shop of the highest quality and integrity. We are a full service violin shop, taking great pride in catering to all levels of string players, from students to professionals. The Beckmann Violin Shop staff strives to provide our customers with the expertise to help choose the instrument which best suits their needs. This guidance can make choosing the perfect instrument a rewarding experience. We are able to accomplish any necessary repair, from a minor problem to a major restoration. Having years of repair and restoration experience creates an environment where your instrument and bow will receive the highest quality care and service necessary to keep it in optimum playing condition. The Beckmann Violin Shop carries a wide range of the highest quality student instruments and bows available. We carry violins, violas and cellos by Snow, Eastman, Caligari and various other fine Chinese manufacturers. We are the sole representative for Sophia Violins in the Kansas City area. We carry violin, viola, and cello bows by a number of German makers as well as the fine bows being made in Brazil today by Arcos Brazil and others. All instruments and bows are set up and adjusted on the premises to ensure optimal playing condition. We work with many fine small violin shops around the country to provide our customers with a variety of choices of fine modern and antique instruments and bows. © 2019 Beckmann Violin Shop, Inc. All Rights Reserved.